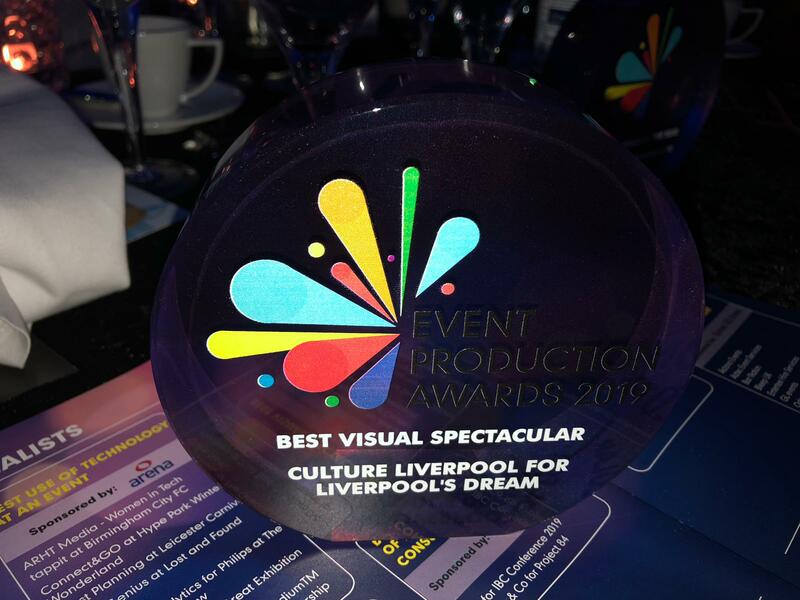 Last night (Thursday 14 March) Liverpool’s Dream was named Best Visual Spectacular 2018 by the Event Production Awards – a prestigious industry accolade. And it wasn’t the only winner! Liverpool captured a unique double with the city itself being named ‘Best Venue’ for the incredible programme of events which took place across its neighbourhoods in 2018 to celebrate the 10th anniversary of being European Capital of Culture. Rather than just pick one location, the award submission highlighted the role the whole city played in staging various events across the year – from Tall Ships at the waterfront and Red Bull Driftshifters on The Strand, through to Liverpool International Music Festival in Sefton Park and Summer Social in Croxteth Park. When presenting the award to members of the Culture Liverpool team who attended the awards ceremony in London, the Director of the Awards, James Linnen, said both award entries received the highest possible scores from the judging panel. Liverpool’s Dream took place from 4-7 October and brought in 1.3million visitors to the city and Wirral, and generated a massive £60.6m for the local economies. It was funded by Liverpool City Region Combined Authority through their Single Investment Fund. “I’m delighted that both the Giants, and the Liverpool 2018 programme have received the national recognition they deserve – we certainly won hearts and minds last year and now we’re winning awards! “It was a stand-out year with events showcasing so many areas of the city and the wider city region, using our streets as a stage to push boundaries and wow audiences. “The return of the Giants was of course a highlight for so many, and for four days the international spotlight shone on the city and we more than rose to the occasion. “These awards are a wonderful recognition of the ambition, creativity and sheer hard work of not only the Culture Liverpool team, but the wider city council departments integral to staging events and of course our partners across the city. Many Congratulations ! Liverpool my home city has come a long way since the 1950’s. One of the best cities in the world to visit.